Although I had to come inside and sit mending under the air-con for most of today, I have lately been working hard getting lots of furniture done before my big move. My projects always come second to the shop stock but not this month, for once everything *must* be done. Here are a few quick and easy ones that are finished. Leopard cane armchair, mostly a clean and paint job. I'm currently working on a chaise longue in a similar style. 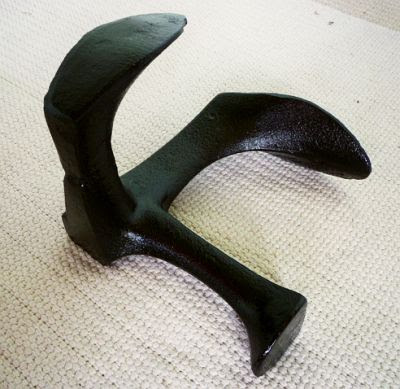 A cast iron shoe last, destined for use as a doorstop, had been hiding under my house since I moved in. A rusty beast which was a freebie off the side of the road, it got a firm attack with a metal brush, a few wipes down with turps and 3 coats of gloss black Killrust. 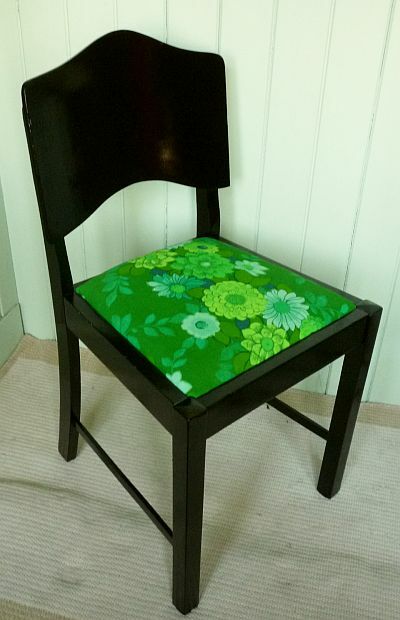 The second black and green chair (another freebie) has now been finished, and will make a fab addition to my workroom. Yes, I'm to have a proper workroom in the new house...can you see my happy dance?! 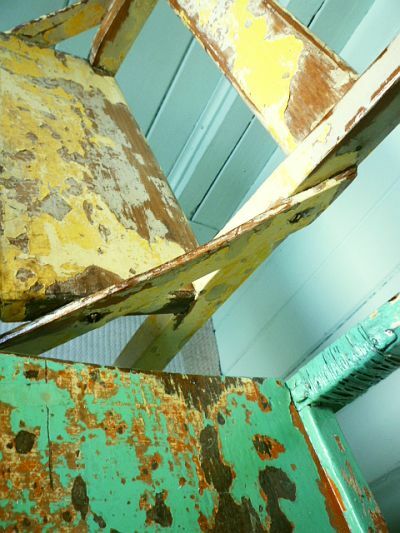 Two hoop pine 1930s kitchen chairs, gifted to me by my landlord. Excuse the bad pic, todays super-bright sun did the beautiful colours in these chairs no favours. These will be my new kitchen chairs, now I'm on the hunt for a table to go with them. 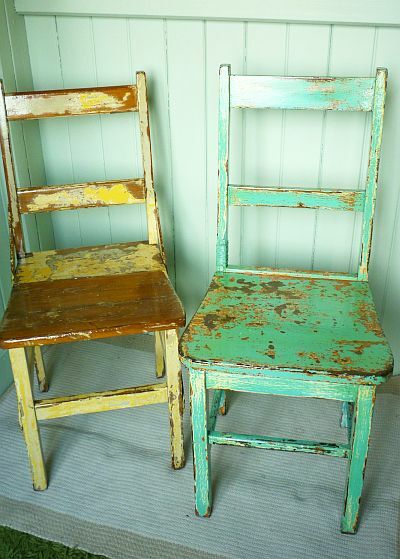 See my totorial on how to do these shabby chairs here. I love all these chairs, the last two especially, but the shoe last is a fabulous find. the weather sounds mad! Are you going to leave the 2 chairs like that? 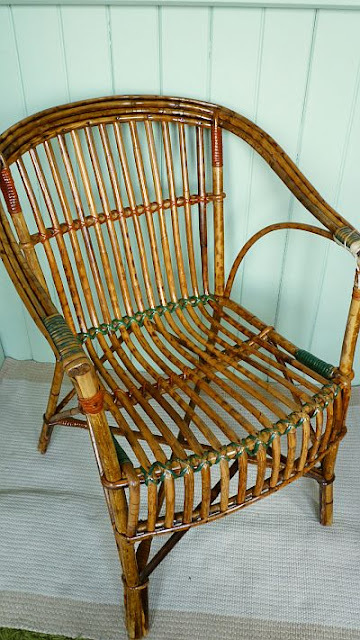 Beautiful cane chair. Yes the 2 chairs are actually finished :) you can't tell from the pics really but they have about ten coats of paint on them and the chips are well-sealed. I adore your chairs but the last 2 are fabulous I would pop those in my home in a heart beat. I love those chairs, they are absolutely gorgeous and perfect for a retro kitchen.